Applicants do not need programming experience to enroll, but once admitted, all students will complete a pre-course tutorial. 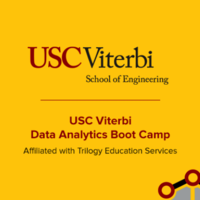 As the program is part-time, USC Viterbi Data Analytics Boot Camp is designed for working professionals and students who are actively pursuing a career change, advancement or looking to gain a new skill set. Throughout the 24-week boot camp, students have access to career-planning services, portfolio reviews, mock interviews and recruiting advice offered by Trilogy Education Services. Graduates will receive a Continuing Education Certificate from the USC Viterbi School of Engineering upon successful completion of the program. In addition, individuals will have a portfolio of projects demonstrating a working knowledge of data analytics. 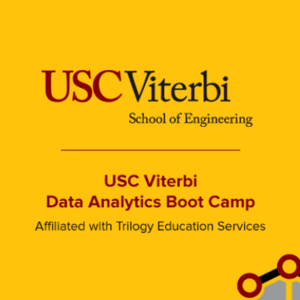 USC Viterbi Data Analytics Boot Camp is powered by Trilogy Education services. The short of it: USC does not release data establishing the success rate of this 24-week program. Therefore, it is an untested commodity with a hefty price tag of $12,500. If a program that teaches data analytics cannot substantiate its value with data, then there is something very wrong with the course. The process of applying: On October 15, 2017, I requested information on USC's website. Within a day, I received a call from an admissions counselor, who asked me about my goals for the program. She told me that the program is for "a select group of  students." She said that if my "career goals align with the program," then I will be allowed to apply. I have to pass an assessment with a score of at least 70 percent, she said. If I am accepted, I can pay to secure a seat in the class. Tuition: If paid in full by November 25, 2017, the cost is $11,500. After this date, full tuition comes to $12,500. Credit value: This course terminates in the issuance of a certificate of completion. You do not earn transferable credit. Students employed in the field within nine months of completion: I asked how many students are employed in the field within nine months after completing the program and at what salary. The admissions counselor said that USC does not provide that data because, she said, the school has seen other programs "misrepresent their data." You would think that USC's approach would be to produce more representative data, avoiding the inaccuracies that it sees in other schools' data, but, no, USC has chosen to publish no data, leaving prospective students in the dark about the program's value. I ended the call and explained why I would not be enrolling in the program. Bottom Line: Avoid this program until USC supports the price tag with verifiable data. Otherwise, you have no reason to expect a return on your investment. As we have not yet begun coursework for our inaugural cohort of students, we do not have data pertaining to the number of our students who follow the course to completion. This Boot Camp is designed to guide working professionals in acquiring skills in data analytics and visualization. It is not intended to replace traditional college coursework, but rather to provide hands-on training in a valuable professional skill set. Students' ability to secure a job after program completion relies on their willingness to utilize the resources they are given and take full, active responsibility for their own job search. Please feel free to reach out to me directly at (213) 814-0250 so that I can provide you with any and all assistance possible. An email with these details has been sent to USC Viterbi Data Analytics Boot Camp. You've already applied to this scholarship with USC Viterbi Data Analytics Boot Camp.